ISIS has joint its conquered territories in Syria and Iraq together (maps) in a new Caliphate simply named the Islamic State, or IS. IS is demanding that all Sunnis pledge allegiance to the Caliph, al Baghdadi. After the genocides on Christians and Yazidi Kurds, and three hostages were publicly beheaded, the world is ready to strike back at Mordor. UPDATE: There's better news from Syrian Kurdistan. Obama's top brass have shredded his war plan against the Islamic State; Obama is about to tell the UN he wants a global travel ban for Jihadists, assuring radicals will turn against their home countries; Islamic State has got Lebanon and Egypt in the crosshairs. And cries about dying babies has already started. Let's hope people are able to withstand sentimental anti war propaganda that hands a moral victory to the enemy - the Islamic State - as if that was possible in a rational world! Iraqi Kurdish official says his forces have begun receiving training to fight ISIL from western allies including US, France, Italy, Germany. Jabhat al-Nusra has claimed responsibility for a car bomb that targeted a Hezbollah checkpoint in Khireba east of Beirut. A human catastrophy is taking place at Kobane at the Turkish border with an area in Syrian Kurdistan which is under attack by the Islamic State. Watch this dreadful situation on video, photos. BREAKING! Turkish army started to use real bullets against the northern Kurds protesting Turkey-ISIS allience at the border point. France has started bombing the Caliphate. While the fate of a number of Kurdish villages near the Turkish border is still in jeopardy. There are reports today that Turkey has finally opened the border for refugees. 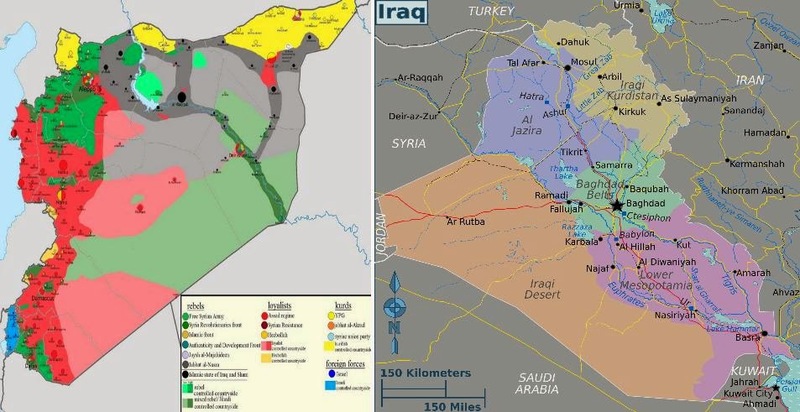 The area is perilously close the territory occupied by the Islamic State. #Kobane is the test for the West. Are they going to sell out the #Kurdish people to #Turkey and #ISIS? #Obama has no conscience on this. Australia has arrested Islamic State loyalists that were plotting to behead random people in the streets, just to drive home their 'reach'. If this has nothing to do with Islam as they are telling us, then what causes these people to be this evil, if not the contents of their minds! Leftists and liberals are scouring the bowels of social determinism, because that is their standard doctrine. They can search till kingdom come, they won't find any evil there. It's in the morality, stupid! Socalled moderates (define!) have already been protesting the arrest of their brethern. Great article in Foreign Affairs, making plain that the arguments made by the Left do not make sense at all! Of the 26 countries pledging support, only a handful will remain. And the Shia are definitely outside the coalition and with Assad and Russia/China a force of their own. And the Kurds have concluded Turkey is useless in their struggle against IS. ISIS' Worst Nightmare http://t.co/0wdMVUdhr0 via @ForeignAffairs--WHY THE GROUP NOT TRYING PROVOKE A US ATTACK -- ALL READ !! Today a meeting called by the French President Hollande in Paris on how a coalition of the willing is going to handle the Islamic State. Muslim states that are not directly threatened will only pay lip service. They just can't afford to be seen as anti Islamic. Therefore we see simultaneously an effort to separate Islam from Islamic, in the tradition of Orwell's Newspeak: Islam is not Islamic, Jihad is peace, Freedom is slavery, ignorance is strength. The Shiites hate the Great Satan more than they fear the Sunni Caliphate. 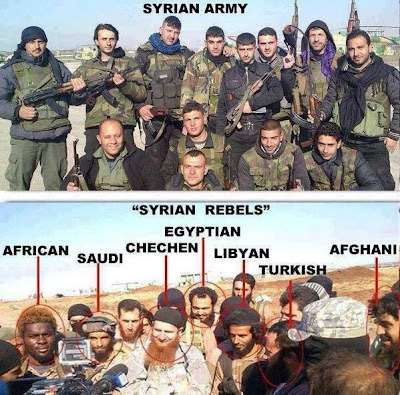 Here's some proof how wrong Obama's premises are when it comes to arming the so called 'moderate' Syrian rebels. (Source) Not only have they been selling hostages like Sotloff, and American arms and cars to Nusra and ISIS, they have also signed a non aggression pact. Also there's a push to include Iran in the coalition. Kerry is resisting the temptation, if he has any: it will be hard to fight IS without aiding the cause of Assad, who is aligned with Iran. Red Line: Israel tells US it will act if ISIS reaches Jordan. http://t.co/t7Jc9hbzuG | Note - We keep ours. Germany has today banned #ISIS with immediate effect. Applies to any activity including waving the black flag. Plenty of criticism of Obama's war on the Islamic State, which is 'unislamic' because 'no religion condones terrorism' and which isn't a war, but a sustained counter terrorism operation, according to Susan Rice and John Kerry. These misdirections are all for political reasons. What's more, the non-war will be so sustained, the next President can be assured of inhereting Obama's mess in the Middle East. It is no surprise that the other side - meaning the Russians, Iran and Assad in Syria - are having objections to the Obama plan of action. But it looks like Assad will not retaliate if the US strikes at IS inside Syria. The Russians want to go it through the UN. For some reason the Germans (no surprise) and the British are refusing to participate in combat rolls. That may have something to do with the political part of Obama's motivation. And the most worrying part, the arming and training of the 'moderate Syrian rebels'. More insights here. (Source) More about that aspect of the war tomorrow. On the eve of Sep. 11 and Obama's speech outlining the strategy how he proposes to deal with the Islamic State, two primers on the state sponsors and the identity of the Caliphate. SecDef says >100 Americans are fighting w/ ISIS: http://t.co/pt8Vqajn00 RT if you support my bill to ensure they never come back to the US! It's again the 'moderate Syrian' part that is worrying. These are supposed to be refugees in Jordan. But no one knows for sure. Feinstein on ISIS, POTUS: "I want to congratulate the president. He is now on the offense." With 2 Lebanese soldiers now killed by IS, emphasis on mediation rises - but #Qatar team was turned away by IS yesterday - no progress. White House Muslim Brotherhood leader Elibiary tweeted that a “Caliphate” is inevitable and compared it to the European Union. Good news from the margins of the NATO summit. But that's not to say the mistakes of the recent past will not be repeated. And talking to Assad isn't out of the question, at least for the Europeans. Wilders: "Madame Speaker, War Has Been Declared Against Us"
Text of Geert Wilders' speech today in Parliament during the debate on Jihadisme and the Islamic State. Madam Speaker, actually I was expecting flowers. I am celebrating an anniversary. Exactly ten years and two days ago, I left a party whose name I cannot immediately remember. During these ten years and two days. I have been much criticized. Mainly for saying the same thing. My critics are right. Indeed, my message had been the same during all these years. And today, I will repeat the same message about Islam again. For the umpteenth time. As I have been doing for ten years and two days. I have been vilified for my film Fitna. And not just vilified, but even prosecuted. Madam Speaker, while not so many years ago, everyone refused to broadcast my film Fitna, we can today watch Fitna 2, 3, 4 and 5 daily on our television screens. It is not a clash of civilizations, but a clash between barbarism and civilization. The Netherlands has become the victim of Islam because the political elite looked away. Here, in these room, they are all present, here and also in the Cabinet, all these people who looked away. Every warning was ignored. As a result, also in our country today, Christians are being told: "We want to murder you all." Jews receive death threats. Swastikas at demonstrations, stones go through windows, Molotov cocktails, Hitler salutes are being made, macabre black ISIS flags wave in the wind, we hear cries, such as "F-ck the Talmud," on the central square in Amsterdam. Indeed, Madam Speaker, this summer, Islam came to us. In all naivety, Deputy Prime Minister Asscher states that there is an "urgent demand" from Muslims to "crack down" on this phenomenon. The Caliphate Truthers: It's the CIA! The stuff of conspiracy and the 9/11 Truthers: IS = CIA. It's starts with the logic that the Americans trained the Mujahideen to fight the enemy, like what happened in Afghanistan with proto Al Qaeda to fight the Soviets. So far, so good. A similar situation occurred in Syria with the 'moderate' rebels that are fighting Assad. This group eventually became part of ISIS and is now the Islamic State = the CIA. This is supposed to explain everything, as in: Q.: Should we bomb the Caliphate to hell? A.: Errrm, well, it's the CIA. OK??? Obama: "IS Does Not Speak For Religion". Really? There are quite a few people who labor under the logic that religion is synonymous with Christianity. It leads to expressions like: Religion can never be evil, and there's no religion that teaches the killing of innocents, etc." They confuse Christian morality with religious morality. These confused people are sitting ducks for the lies of Islam apologists and terrorists. If you meet these people, please set them straight, because they will never be able to figure out what is going on. Religion is NOT ethics, and religion is NOT Christianity. The ethics program of a particular faith depends entirely on the nature of the godhead, the universe and the place of man in it. Cannibalism is a religion, there are gods that demand human sacrifices. Differences matter! Compare Christianity and Islam here and here. Freedom requires informed and responsible citizens. Substitute it with violent collectivists and Governments that are here to protect us, turn into tyrants that violate civil rights. Freedom and security are in a zero sum game requiring careful balance at all times. They idea that rights of unconvicted suspects can be imposed upon by the state is a paradigm shift in what we define as justice. We ain't seen nothing yet! To those who think this is great news, think again! I'm sorry @holland_tom, but this is a dangerous statement. Clerics reaffirm Islamist view, Muslims r seperate from the rest of society. Islamic State: "Turkey Is Next"
Yes, well. On account of 500 jihadists at home the UK is kicking up the alert level up a notch to severe. There's a demo in the Netherlands next week by a group of Muslims, that will protest IS, as well as...Israel! (Source) The Guardian has already taken the lead in justifying IS, for being "oppressed Sunnis". As for the BBC! ISIS has declared the Caliphate in the territory it is holding in Syria and Iraq and has adopted the name IS, Islamic State. "We Don't Want to Alienate Muslims by Attacking IS"
Aug 27, 2014: Megyn Kelly up in arms over Obama fundraising around the country as the threat of ISIS grows. The orc armies are now approaching Israel's back yard. And an Islamically correct explanation why Obama insists on naming IS, ISIL. A Grand Coalition With Assad and Putin Against IS? Obama has manipulated himself into an impossible contradiction: supporting IS in Syria, while fighting it in Iraq. Some foreign policy makers are pleading for a sort of grant coalition with Assad and Putin against radical Islam. This is much like the allies in World War II: the free world teaming up with the communists to fight the Nazis. After the war it turned out a colossal mistake: evil is still evil, even if you happen to share an enemy. No anti-I.S. drones over Syria b/c "Assad’s forces control the air" http://t.co/wBtZeIVbxG So much for Assad-as-partner against takfiris. The genocides by the Caliphate in Syria and Iraq have become a separate issue. You can find the news on this Live Blog. In the meantime news has emerged of more war crimes by the Caliphate. Jihadists from the Islamic State have killed at least 50 Syrian soldiers in an ambush, summarily executing most of them after their capture, a monitoring group says. The assault in Raqa province, the jihadists' Euphrates valley stronghold, came amid their fiercest assault yet on Damascus-held territory. The deaths added to 74 already killed in the offensive across the north and northeast, the Syrian Observatory for Human Rights said on Friday (local time). "At least 50 soldiers were ambushed, some of them were killed in fighting but most of them were beheaded," Observatory director Rami Abdel Rahman said. IS militants claimed the toll was as high as 75. The destruction of Jonah's tomb was reported earlier, but was subsequently denied. Now there are the pictures to prove it. The devil's brood is on the loose! This man has equal rights to every other law abiding citizen of the Netherlands. But has he earned those rights? Maybe something is wrong with the liberal democratic principle that forbids discrimination in any way. Obviously there is no moral equivalence here. Perhaps citizenship, passports and civil rights should be given on the basis of merit. Not just becausee a person happens to be on Dutch soil. Civil rights are constantly confused with human rights. Do you want to see this flag flying in Europe? Apparently yes. The demoralized West has no defense against evil. Some 100 ISIS followers participated today in a pro Gaza demo in The Hague, the second in a row. The mayor must have given the rally his blessing. During the demo the press was intimidated and eventually threatened. Ultimately some had to take refuge in a police precinct. The world on it head. The Caliphate: "We're Coming For You"
ISIS released a new video on Sunday titled “The End of Sykes-Picot” (check the maps blog for more). The Islamist Abu Saffiya from Chile, shows off the spoils of war and raises the Islamic flag at a former Iraqi military base. Another Islamist mocks Obama at the end of the video. Islamist Abu Saffiya from Chile presents the Caliphate's latest propaganda coup. More on the Balkans Caliphate. ISIS, or IS as it is now called, has declared war on Jews, Christians and every other Islamic denomination other than its own, and is now running the risk of internecine battles with other Sunni Muslims. Almost immediately after its declaration Sunni groups have raised objections. Not against the Caliphate on principle, but on technical grounds, as scripture and non consultation. This evil will certainly not stay contained in the Middle East. It will inevitably reach the West sooner rather than later. Obama has raised the point today, that those with European passports don't require any visa for the US. Western Governments will have to act before it is too late. I invite you, Taliban, al-Shabab, Hamas, al-Ikhwan al-Muslimeen, Hizb-ut-Tahrir, Al-Qaida, and all other groups, fear Allah and give bayah! (...) Professor Peter Neumann, from the International Centre for the Study of Radicalisation at King's College London, said the significance of today's announcement should not be underestimated. "It's a declaration of war – not only against the west and all the countries that are currently fighting Isis, but more importantly, against al-Qaida. Isis now see themselves as the legitimate leaders of the movement and they expect everyone to fall in line. "For ideological jihadists, the caliphate is the ultimate aim, and Isis – in their eyes – have come closer to realising that vision than anyone else. On that basis, Isis leaders believe they deserve everyone's allegiance. "This could be the end of al-Qaida. It depends on how they respond. Unless they come out fighting, this could mark the end of Bin Laden's vision and his legacy." Israel understands the Middle East. You don't kindly ask the bullies to behave, and you don't reward acts of violence with negotiations. You make them expensive, you make em pay as dearly as possible. The nation state and borders are Western constructs on an area that once was the Ottoman Empire. To understand the situation on the ground we must look beyond state lines. This map of Syria (left) shows the sectarian division on the ground. It makes clear how ISIS could overrun Mosul in neighboring Iraq as easily as it did: ISIS already controls the western side of the border (present situation). <sarcmodus on> Who could've thought this sort of incident would happen. Could have happened anywhere, right? Terrorism is not that bad actually. More people die of musquito bites each year, yah know! </sarcmodus off> Primary duty of the government is the protection of the citizens. That's why we have given them the monopoly on the use of force: this thing is serious, because it goes to the legitimacy of the state. Moreover, the Syrian rebels are our allies. This is what you get when you make a pact with the devil. An article by Reuters falsely speaks of "growing antisemitism in Europe" but fails to mention how that is imported. After the news broke in January that Western intelligence agencies had been in touch with the Syrian regime for rapprochement talks, and Germany, Switzerland, the UK, Italy, Austria and Spain even considered re-opening their embassies in Damascus (blog on Feb. 2), it turns out the Obama regime has no such contingency plans. The Obama regime is still laboring under the false notion there are such rebels as 'moderate Jihadists'. It is believed the weapons from Benghazi, Libya made their way to Syria and the covert operation cost the American Ambassador and three others their lives. According to a PBS docu the CIA is currently training and arming rebel groups in Qatar. This is a dangerous game, the same game that spawned Al Qaeda in the first place. Obama would have been wiser to bomb the hell out of the mullahs, but for obvious reasons that is not on the cards. UPDATE: The extremists of Al Qaeda are outraged by the extremism of ISIS! They want no part of them anymore..
Western intelligence agencies have visited Damascus for talks on combating radical Islamist groups, Syria's deputy foreign minister has told the BBC. Faisal Mekdad said there was a schism between Western security officials and politicians who are pressing President Bashar al-Assad to step down. The growth of jihadist groups among rebels fighting President Assad has caused international concern. The Syrian opposition says it has "a real dilemma" over the alleged links. Khaled Saleh, spokesman for the Syrian National Coalition, told the BBC that if the reports of European intelligence contacts with Damascus were true, "it would show a clear contradiction between the words and actions of the Friends of Syria group" who had "clearly identified the Assad regime as a source of terrorism in the region". UPDATE: While Israel has remained tight-lipped over an alleged strike in Syria, an Obama administration official confirmed to CNN on Thursday that Israeli warplanes had in fact attacked an airbase in Latakia on Wednesday. The target was “missiles and related equipment the Israelis felt might be transferred to Hezbollah,” the report said. 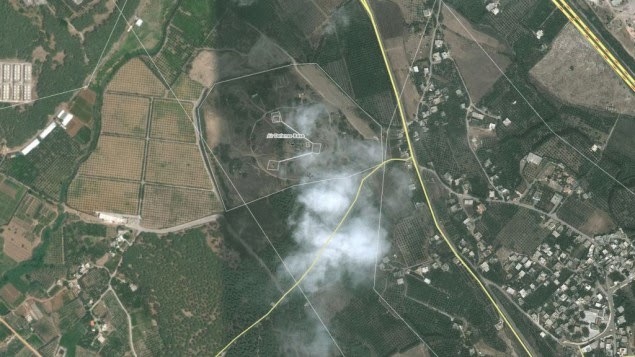 Earlier Thursday, on the heels of reports that the airbase had contained advanced, Russian-made anti-aircraft missiles, Al-Arabiya reported that Israel had attacked not one, but two targets in the civil war-torn country. Former Ambassador to the UN, John Bolton analysing the situation. Syrian Opposition Forms Joint "Army of Islam"
In a reminder of the Fabel of the Scorpio and the Frog the Al Qaeda aligned Salafi rebels have now turned on the 'moderates' in the FSA. While Obama waives ban on arming terrorists to allow arming the rebels, Glenn Beck figures this is treason and an impeachable offense. Have Saddam's WMD Surfaced in Syria? The UN has confirmed Sarin has been used in the gas attack. The UN can't ascertain which party has used it. Putin has outwitted the Obama court eunuchs (h/t Mark Steyn) and laughed them off the world stage. This will have very serious repercussions for the future. The US is no longer a serious moral arbiter (or any arbiter), thanks to Obama's postmodern diplomacy. We will soon all know that the absence of Pax Americana means that the hegemonic vacuum will be filled by predators. As for Putin’s American-exceptionalism crack, he was attacking less the concept than Obama’s opportunist invocation of it as justification for military action in Syria. Nevertheless, Democrats and Republicans alike took the bait. Eager to mend bridges with the base after his amnesty bill, Marco Rubio insisted at National Review Online that America was still, like, totally exceptional. Sorry, this doesn’t pass muster even as leaden, staffer-written codswallop. It’s not the time — not when you’re a global joke, not when every American ally is cringing with embarrassment at the amateurishness of the last month. Nobody, friend or foe, wants to hear about American exceptionalism when the issue is American ineffectualism. The failure is so bad that some observers have seen a calculated plan in Obama's ineptitude of willfully wanting to reduce the US to a 'normal'' country. Summing up the net effect of all this, as astute a foreign observer as Conrad Black can flatly say that, "Not since the disintegration of the Soviet Union in 1991, and before that the fall of France in 1940, has there been so swift an erosion of the world influence of a Great Power as we are witnessing with the United States." Putin's article in the NYT is making waves all over the world for its sheer audacity. Whereas it is exceptional that a head of state is talking to a people over the head of its head of state, Putin surely has no notion of what American exceptionalism is! It isn't nationalistic superiority, but Liberty itself; a government that isn't served by its people, but is the servant of the people. ASSAD SAYS WILL COMPLETE DEAL ONLY IF US STOPS "POLICY OF THREATS"
Charles Crawford, former ambassador to Serbia: "Worst day in Western diplomacy"
Hours before Obama is addressing the nation Syria said Tuesday it has accepted "Russia's proposal" to place its chemical weapons under international control for subsequent dismantling (which is actually Kerry's gaffe). Syrian Foreign Minister Walid al-Moallem said Tuesday after meeting with Russian parliament speaker that his government quickly "agreed to the Russian initiative." Al-Moallem added that Syria did so to "uproot U.S. aggression." His statement sounded more definitive than his remarks Monday, when he said that Damascus welcomed Russia's initiative. Meanwhile, Russia's Foreign Minister Sergey Lavrov said Tuesday that Russia is now working with Syria to prepare a detailed plan of action. Serious political reforms that will result in free and fair presidential elections. Assad will not be allowed to run in future presidential elections and agrees to step down from power. An international committee will supervise control of Syria’s chemical weapons arsenal. The international community, with U.S. participation, will help rebuild the Syrian army and security services to guarantee participation from all factions of the population. The model for this reorganization is the so-called Dayton plan that has been overseeing the restructuring of the Palestinian Authority security organizations and militias. According to the IDF the test was executed jointly with the United States military. A test at this time may be less of a "test" and more of a warning. Sometimes it isn't the build up to war which increases tensions it its the perceived buildup. Iran which has not slowed down its nuclear weapons program despite the election of what the western media calls a "moderate" president, believes that Israel is close to stiking its nuclear facilities. At least that is what is being reported in Lebanese newspaper Al Jumhuriya. "Kerry insists Syrian rebels are secular"
In a report that is sure to be considered blockbuster news, the rebels told Dale Gavlak, a reporter who has written for the Associated Press, NPR and BBC, they are responsible for the chemical attack last week. Gavlak is a Middle Eastern journalist who filed the report about the rebels claiming responsibility on the Mint Press News website, which is affiliated with AP. In that report allegedly the rebels told him the chemical attack was a result of mishandling chemical weapons. This news should deflate the accusations, against the Assad regime, coming from the U.S., Britain, France and the Arab League. Two rival views on the chemical weapons issue. As far as this blog is concerned, it's a hardly relevant side issue. The West merely requires a cause that justifies a moral war (JWT). Combatting evil alone is an insufficient cause as far as the Kantians are concerned. But Syria is not even a signatory to the convention against chemical weapons. RUSSIA, "Opposition Impedes Investigation In Chemical Attack"
RT is breaking news that materials pointing to forces of Syrian president Bashar Assad use of chemical weapons near Damascus were prepared prior to alleged incident on August 21, the Russian foreign ministry said. The Damascus chemical attack accusations indicate the launch of “another anti-Syrian propaganda wave” and, in this context, the calls on the UN Security Council to immediately use force in Syria “heard from some EU capitals” are “unacceptable”, Lukashevich said. The Foreign Ministry spokesman said that Assad’s government has demonstrated a “constructive approach” to the chemical weapons issue by allowing UN experts into the country. But it’s alarming that the “same signals” aren’t coming from the Syrian opposition, which so far hasn’t displayed willingness to ensure the safety and efficient operations of UN investigators on the territory it controls, he said. REPORT: "US Led Incursions into Syria Begun, Assad Countered with Chemical Attack"
Assad is acting to counter the first organized incursion of US-trained Syrian rebels from Jordan into southern Syria. The first group of 250 rebels, trained in special operations tactics by US and Jordanian instructors, entered Syria Saturday, Aug. 17, armed with weapons of Russian provenance supplied by the US and Saudi Arabia. They are fighting under US and Jordanian commanders based in Jordan. A second group of 300 fighters crossed into Syria from Jordan Monday. They are linking up with local rebel groups chosen from amongst those with no ties with the jihadist Jabhat al-Nusra (Al Qaeda in Syria). According to military sources, the rebel units are advancing at speed along the Syrian-Israeli border. They have forced the Syrian brigades posted there into retreating from positions inside a strip of 1-25 kilometers from the border, and captured the villages of Raihaniya, Breiqa and Beer Ajam. This tactic has moved the Syrian army back from the area opposite the Israeli Golan, and started marking out a buffer zone between Israeli and Syrian forces in the Horan province. Military sources report that additional Syrian rebel forces are standing ready in Jordan to cross into Syria. The incoming forces will then start extending the nascent buffer zone northward towards Deraa (fountainhead of the Syrian uprising in 2011) and east toward Jabal Druze. Why Didn't the Obama Admin Give Warning for the Chemical Attack?